Packing for London was a difficult task, I knew that I needed to pack a long-lasting, travel friendly base that is also suitable for concerts. I chose my Chanel Vitalumiere Aqua foundation because it’s light weight, long lasting and really travel friendly. Keeping things to a bare minimum was also a challenge as I knew I would have to carry it all around London for two days. 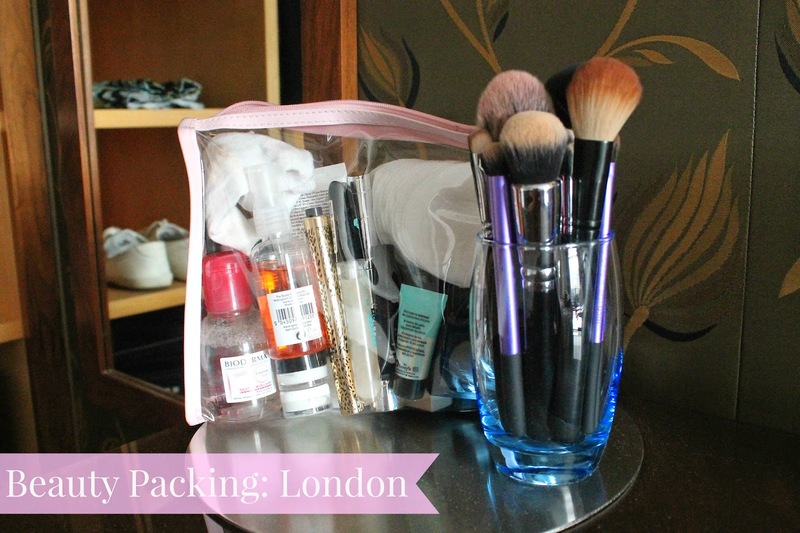 I chose to pack everything inside this clear plastic makeup bag that I got from Primark in a pack of 3 because it would be easier to find everything that I needed and the packaging is really travel friendly and lightweight. -I still managed to over pack. It may look like a lot, but I did use everything I took with me and for me, this was no where near enough that I would normally take with me for a short trip away. I seriously over pack in the beauty department just in case plans change and you need a more party look, or my skin misbehaves and I need a foundation that offers a higher coverage. You’ve gotta be prepared for all occasions, right? Comment below if you think this was a lot of makeup for two days, or no where near enough. How much do you pack?